Now itâs not the usual field that we cover, but it hit our radar. How many times have you seen an enthusiastic presenter or an excited contestant on TV drop their radio mic and crawl around on the floor, trying to pick it up! Well when a costume designer and a sound man get together then things get designed, and why this hasnât be invented before is beyond us, but it looks like an idea that could take off. Read the full article here. Sound recordist Simon Bysshe and costumier Laura Smith have combined their knowledge and expertise to create URSA Straps, a unique range of low profile body worn straps designed to conceal radio microphone transmitters. Officially launched this month and now available in the UK and Europe, URSA Straps are made from a specially developed bonded fabric that is ultra-slim and provides excellent stretch, comfort and breathability. Each strap incorporates a pouch to keep the transmitter locked in place and a cable pocket for managing excess microphone cable. 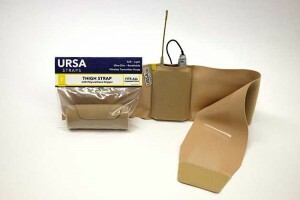 URSA Straps are available in black, beige and brown skin tone colours and can be worn around the ankle, thigh or waist. Bysshe and Smith developed URSA Straps after listening to numerous artists express discomfort while wearing radio mic straps. Traditional thick neoprene or elastic straps can irritate the skin, become soaked in sweat and are often impossible to disguise under figure hugging costumes. Laura Smithâs knowledge of costume making proved invaluable as she was able to construct prototypes and identify the exact fabrics required to suit the needs of costume, artists and sound departments. Bysshe tested the new straps while working on the second series of Sky AtlanticâsÂ The Tunnel. Lead actress ClÃ©mence PoÃ©sy was an immediate convert and provided valuable feedback to help develop the product. Bysshe has subsequently used URSA Straps on the third series ofÂ Peaky Blinders. The USRA Thigh straps were particularly popular with the cast members who found them secure, light and comfortable. The fact they can be worn around the thigh as opposed to the waist made them invaluable for use with the period costumes. Outside film and television, URSA Straps are also proving popular with dancers who need to receive audio cues during a live performance. Using waist or thigh straps the sound team can easily conceal a receiver pack on their bodies without restricting movement or compromising the look of their costumes. URSA Straps have also developed a Double-Pack strap allowing artists to wear two packs on one strap. Oscar-winning production sound mixer Simon Hayes was an early adopter of URSA Straps and describes them as a total game changer for his team. URSA Straps are suitable for a variety of wireless transmitters including Lectrosonics, Zaxcom, Wisycom MTP40 and Sennheiser 5212. Two different pouch sizes are available to ensure optimum fit. Three different waist sizes are available: small, medium and large.